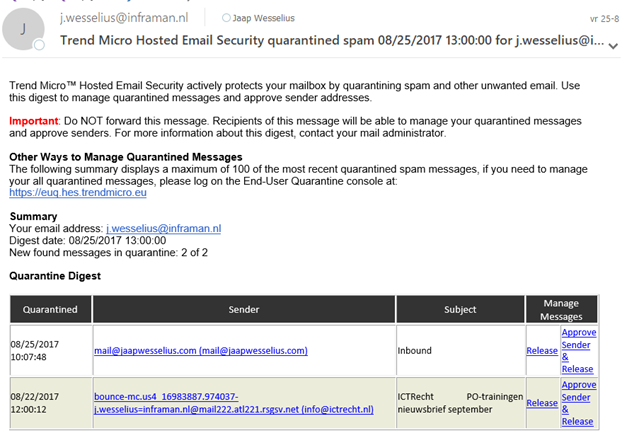 A couple of years ago I have been working with the TrendMicro Hosted Email Security (HES) solution and I was very satisfied with it. With the upcoming SPF, DKIM and DMARC awareness I was looking for online solutions that offer this kind of security measures and I found that HES now offers these solutions as well. This a hybrid configuration with a centralized mailflow. 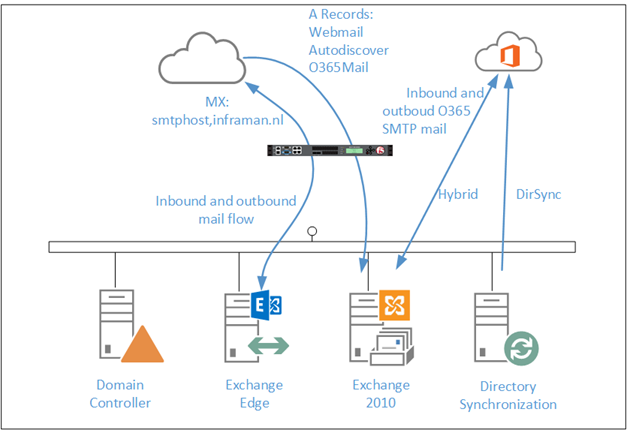 All email is sent and received through the on-premises Exchange environment, including email from and to Office 365. 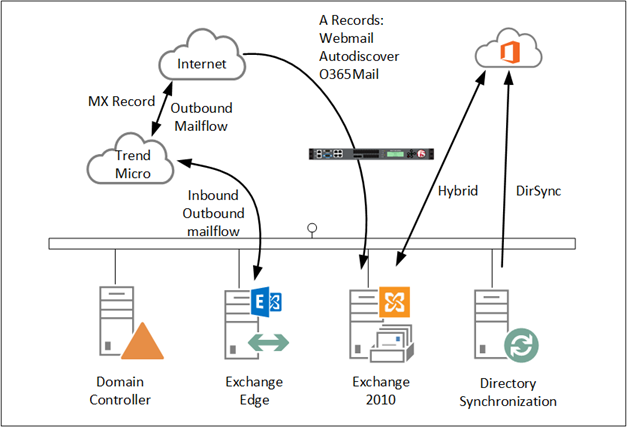 So, email sent to the internet by users in Office 365 are sent first to the Exchange 2010 servers, and then via the Edge Transport servers to the Internet. This way you have full control over your Internet mail flow. But back to HES…. When using a cloud service in this configuration incoming mail is sent to the cloud service which does all the necessary security stuff. From there it is delivered to the on-premises Exchange 2010 servers. In this scenario mail is still delivered to the Edge Transport servers because these are located in the DMZ. Outbound mail is sent from the on-premises Exchange servers to the HES cloud service and from there to the intended recipients on the Internet. 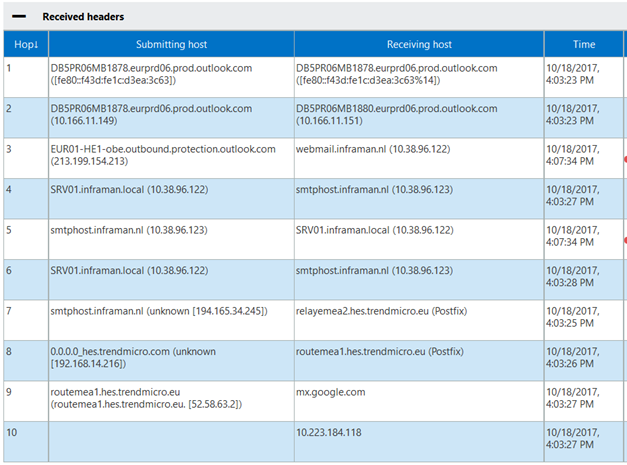 Instead of pointing to the Edge Transport servers, the MX record now points to in.hes.trendmicro.eu. In the TrendMicro HES console, when configuring the domain, you also specify the inbound servers (i.e. Edge Transport servers smtphost.inframan.nl) en when outbound filtering is enabled you also specify where the outbound messages are coming from. The Send Connector in Exchange 2010 needs to be changed as well. Instead of using MX for delivering mail you need to specify a smarthost for HES, which is relay.hes.trendmicro.eu. Hotmail messages, or messages from/to my own Exchange 2016 environment show a similar mail flow, so this looks good. And I must admit, less spam messages are delivered in the user’s mailboxes. But, at this moment I’m not looking for the anti-spam and anti-virus solution, but I’m primarily interested in the SPF, DKIM and DMARC features of the Hosted Email Security solution. This is the subject for the next blog.